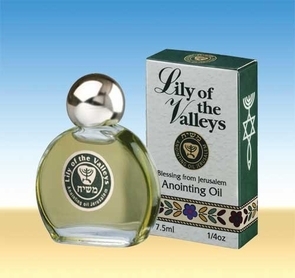 This is a special 7.5 "lily of the valleys" anointing flask inscribed with a blessing from Jerusalem, in order to create the atmosphere of blessing that the holy city can bring. The original perfume is based on natural essences made of plants characteristic of the Land of the Bible and flowers from the Holy Land. To be anointed means to be in the presence of God. People and things are anointed to symbolize the introduction of a divine influence, spirit or power. Biblical scripture teaches us that olive oil is the means of achieving this desired state of being. In so doing they only recognize the spiritual anointing that the Bible speaks of. But you have an anointing from the Holy One 1 John 2:20. But the anointing, which you have received from Him abides in you 1 John 2:27. In so doing they only recognize the spiritual anointing that the Bible speaks of. But you have an anointing from the Holy One 1 John 2:20. But the anointing, which you have received from Him abides in you 1 John 2:27.